Not tried Reaper yet? You should. MusicRadar users dig Reaper - in fact, you recently voted it your favourite DAW. This cross-platform application has a tiny installer (just 8MB, in fact), yet boasts powerful features that put it on a par with many of its more expensive rivals. What's more, those who've been frustrated by other DAWs frequently report that it's easier to use. If you're stuck with a dodgy vocal take, don't panic - you might be able to get away without re-recording it. Reaper includes a handy little plug-in called ReaTune, which works in a similar way to Antares Auto-Tune. Simply set the correction mode to a scale and key, and the plug-in will do the rest. Alternatively, the manual correction mode can be used for more in-depth pitch manipulation. When using lots of plug-in instruments and effects, you may find yourself running out of CPU power. Thankfully, Reaper's Performance Meter window offers the most advanced performance analysis we've seen, showing you exactly which tracks are consuming the most power. It can be accessed from the View window. One cool way to streamline your workflow is to save commonly-used combinations of instruments or effects as FX chains. To do this, right-click the FX window and select Save FX Chain. These can then be added to any track by right-clicking it and selecting Add FX Chain. Stuck for inspiration? Reaper includes a great tool for online collaboration in the shape of ReaNINJAM. This plug-in enables users to jam together over the internet. For more details, head to the NINJAM website, where you can access the NINJAM community forum. These days, many DAWs eschew multiple floating windows and instead opt for a single-window approach. Reaper gives you the best of both worlds: by default, the MIDI grid editor, performance meter and so forth all open in new windows. However, they can also be docked at the bottom of the screen by right-clicking them and selecting the Dock option. Need to beef up a track in a hurry? 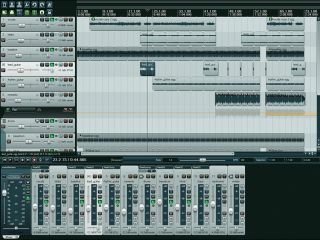 Give Reaper's Tracks»Duplicate Selected Tracks function a whirl. This creates identical copies of any and all selected tracks, making it perfect for doubling MIDI lines, or for performing parallel processing on audio parts. Reaper offers a variety of different automation curves. To select a curve type, right-click an automation point and pick Select Shape For All Selected Points from the menu. You'll be presented with a choice of several well thought-out curve types, which can help make getting that perfect sweep or fade that little bit easier. With complex projects, it's easy to get confused and edit items you might not mean to. In order to avoid this, check out Reaper's lock function. Open the Appearance»Media section of the Preferences menu and ensure that both Locked and Unlocked in the Media Item Icons panel are selected. All media items will now display a lock icon that enables you to fix their position. Another useful feature when working with complex or longer projects is Reaper's ripple mode. This is activated by pressing Alt+P, or via the Options»Ripple Editing menu entry. With ripple edit mode activated, any audio object you move on any given track will also move everything else on that line. One of Reaper's best-kept secrets is the ludicrously-named ReaSamplOmatic 5000 instrument. A basic sampler, it's nothing particularly out of the ordinary, but its modest CPU usage requirements and straightforward interface make it worth checking out. It can only load a single sample, but you can use multiple instances for multisampled patches and drum kits. If you're struggling to keep those CPU cycles down, consider using Reaper's clever Render Selected Tracks To Stem Tracks (And Mute Originals) function, in the Track menu. This quickly creates a bounced version of each track, including any effects processing. With the original tracks automatically muted, your CPU is freed up for other tasks. If you continue to use Reaper after the 30-day evaluation period, you really should register it. Not only will this help fund development of the DAW and give you a nice, warm feeling inside, but once you've done it, you won't have to wait for the irritating countdown timer each time you launch it. For a complete guide to using Reaper, check out the May issue of Computer Music (CM151) which is on sale now.